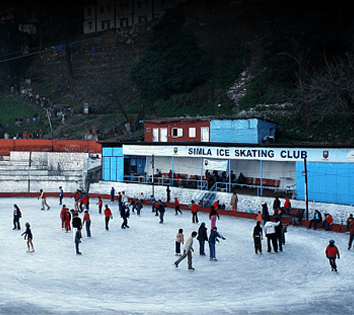 Open-air ice skating rink in Shimla is the best place to enjoy sliding and tumbling on ice. A very popular sport in the western world but conducted in very few places in India, the Shimla rink is the oldest one in the country. As temperatures begin to fall in December, the rink opens its gates for ice-skaters who throng the place. There are two sessions every day, one in the morning and another in the evening. Visitors can enjoy skating under clear skies for a nominal fee; skates are provided at the rink. The season usually lasts till February. Competitions in figure skating, speed skating and ice hockey are held. Around the Christmas – New Year’s, the ice skating carnival is a time when daily festivities take on a fresh dimension. The swish of blades on ice, tuned to the music, fancy dress competitions, waltzes and tangos on ice, races and ice hockey matches are held before packed audiences. As darkness falls, for the finale, lights are turned off. Holding blazing torches aloft, skaters steadily glide out of the pavilion for a mesmeric romance of fire and ice.